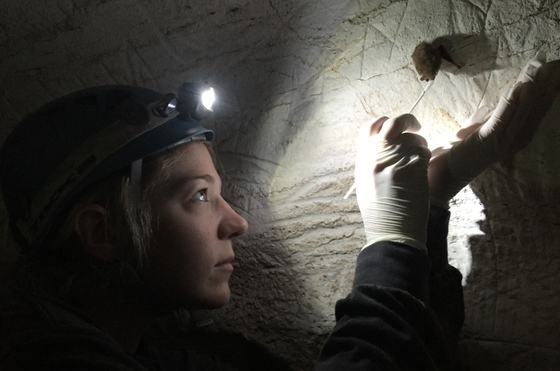 The past year brought a lot of news about white-nose syndrome, and little of it good. The fungus that causes white-nose, Pseudogymnoascus destructans, or Pd, is being found in more places, from Washington to China. It's no surprise that the impact of WNS, often marked by white growth on the muzzles of hibernating bats and blamed for the death of more than 6 million bats in North America, also is growing. Surveys this winter in north Georgia revealed that bat numbers have declined by 92 percent in 10 sites monitored since before WNS arrived. 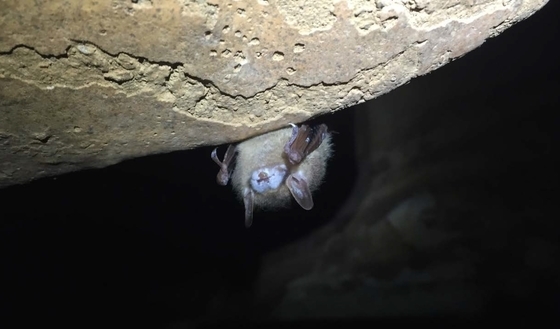 DNR biologists can only survey a small number of caves but these likely represent the big picture of what’s happening to bats in the northern part of the state. Preliminary data also shows that the scientists are catching fewer bats in summer. Read the 2016 report and 2015 overview. Elsewhere, University of California at Santa Cruz researchers announced they found Pd throughout China. Some bats had skin lesions characteristic of WNS, although there is no evidence of a population collapse in Asia. Across the U.S., Nebraska confirmed Pd in that state and Minnesota reported its first case of white-nose. Yet while the westward spread of the fungus was expected on this continent, the announcement in late March that a little brown bat in Washington State had WNS was a bombshell. The previous westernmost site of the disease was 1,300 miles away, in Minnesota. How did white-nose make it all the way to Seattle? No one knows. It’s possible the fungus is more widespread than known in the western U.S. It’s also possible that someone accidentally spread it, though there’s no evidence of that. Scientists are trying to identify the source of the fungus, and states in between are scrambling to find new winter sites used by bats that might be transmitting the fungus. Some bats are surviving for years in sites infected with WNS. And some species, including the federally endangered gray bat, don’t appear to be developing white-nose, although they carry the fungus. Closer to home, the U.S. Fish and Wildlife Service has named Athens-based biologist Pete Pattavina WNS coordinator for the Southeast to guide protection of areas important to bats. Pattavina also is working with Georgia State University researchers on a WNS treatment project in Georgia. All will help conserve these small creatures facing the giant-sized threat of white-nose syndrome. Katrina Morris leads bat research for DNR’s Nongame Conservation Section. Control insects: A little brown bat can eat its weight in insects in a night; 1 million bats can consume nearly 700 tons a year. Bats save corn farmers worldwide an estimated $1 billion per year in crop damages. This natural pest control also reduces pesticide use. Pollinate plants and disperse seeds: More than 300 species of fruit, including mangoes, depend on bats for pollination. Bats are critical to seed dispersal in tropical forests. Enrich cave ecosystems: Nutrient-packed guano from cave-roosting bats qualify them as keystone species in these habitats. Feed other animals: Wildlife varying from owls to raccoons prey on bats. Benefit science: Bat research has led to developments in sonar, vaccines and other areas. Serve as indicator species: Population changes can indicate broader ecological issues such as forest loss. There are more than 1,300 bat species, almost 20 percent of the mammal species on Earth. Bats are the only mammal that can fly (some other mammals can glide). Pieces of the set from Batman v Superman were made into more than 100 bat houses and auctioned to raise money for bat conservation. Watch the video. The count of eagle nests topped 200 in Georgia again. DNR aerial surveys this winter and spring documented 201 occupied nesting territories, 149 successful nests and 240 young fledged. Two other nests were reported later, bumping the total to 203. The totals are slightly lower than last year’s 210 territories, 170 successful nests and 270 fledglings, all survey records. Yet survey leader Bob Sargent, a program manager with the DNR Nongame Conservation Section, suggested that the difference between 203 and 210 nests is negligible. Despite this year’s dip, nesting for the nation’s bird still points upward in Georgia. 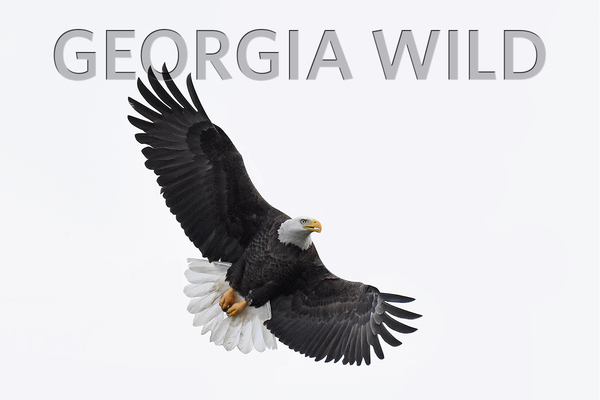 The world's fastest birds are nesting again at Tallulah Gorge State Park. What was a likely a nest by the same pair last year at the northeast Georgia park marked the first peregrine nest documented in a natural area of the state since 1942. The only other known nests are on buildings in Atlanta. The falcons are using the same cliff face as in 2015, although this year the eyrie is hidden behind a rock. “But we've seen them bringing food back to the nest, so we assume the chicks have hatched," park manager Danny Tatum said. Park officials are welcoming hikers to observe the raptors from overlooks; however, rock climbing has been suspended while the chicks, or eyasses, grow and fledge. A great-horned owl nest streamed from Skidaway Island to thousands of viewers has a new attraction: ospreys. After the owls fledged in April, a pair of ospreys began checking out the structure originally built by bald eagles. Yet, while the ospreys also showed up at the nest last year, this spring they seem interested in using it. Video from the nest cam operated by The Landings and Cornell Lab of Ornithology (and shared with DNR) shows the pair demonstrating “courtship feeding,” a behavior that often precedes laying eggs, Bob Sargent said. The Landings is keeping their cam running, and their fingers crossed. Report: Seen an eagle nest? Let DNR know -- online, by phone (478-994-1438) or by email. These reports often lead to undocumented nests. 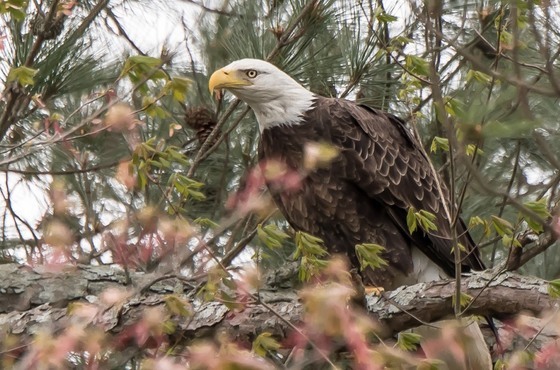 Support: Eagle surveys and other DNR work with rare wildlife and plants is funded in part through sales and renewals of eagle and hummingbird license plates. These tags cost only $25 more than a standard plate and most of that fee goes to conserve wildlife. Upgrade to a wild plate and show your support! Enjoy: Take a trip to Tallulah Gorge to try and spot the peregrines. Follow the drama, from egg to fledge, on Berry College’s eagle cam and The Landings’ bird cam. We enjoy all sorts of parties. There are pool parties, birthday parties, graduation parties, office parties. But there’s one party you will never be invited to – the puddle party. Here’s why you’ll never find this invitation in your mailbox: Mother Nature limits these events to butterflies. And not just any butterfly. 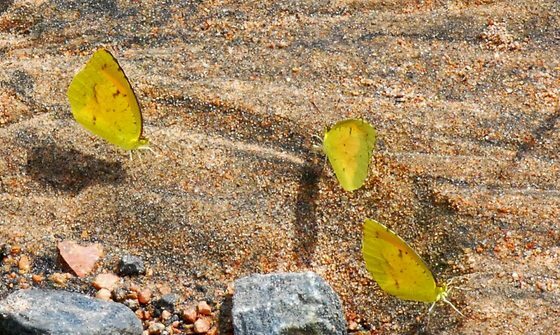 Most puddle partygoers are swallowtails, sulphurs and red-spotted purples, although the short list often includes species such as eastern tailed-blue, harvester and American snout. Read the rest of Terry’s column to learn about puddle parties’ bachelor side, plus how you can create a prime party site in your yard. 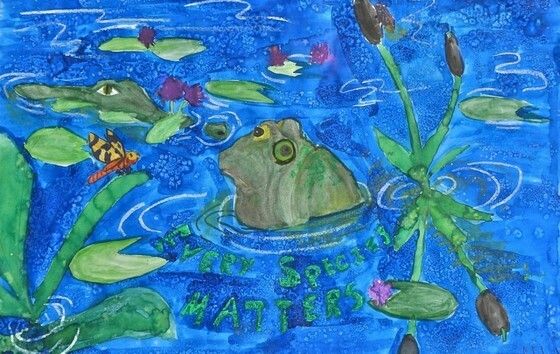 Statewide winners of the 26th annual Give Wildlife a Chance Poster contest are posted on Flickr. The 12 elementary-school children recently named as winners were among about 1,450 kindergarten through fifth-grade students who took part in the art competition held by DNR and the State Botanical Garden of Georgia. The long-billed curlew fitted with a satellite tag in Georgia has made it to breeding grounds in Saskatchewan. Tracked to provide insights into where the species’ dwindling Atlantic Coast population winters, the curlew flew from the coast to Canada in 15 days last month (“Ghost from the coast,” April 19). Young birders continue to raise the bar in the Youth Birding Competition. Overall winner Eagle Maniacs – Gwinnett County teens John Deitsch and Jon Robbins – as well as two high school teams that tied for second all counted more bird species in the 24-hour contest April 22-23 than the previous record, while as many as 10 teams took part for the first time. The $23.7 billion state budget recently signed by Gov. Deal includes $18 million for land conservation, with an emphasis on acquiring lands that have matching funds to protect wildlife species at risk of being federally listed. Deal highlighted that focus with a signing ceremony at the new Altama Plantation Wildlife Management Area near Brunswick. Spring brings black bear sightings in some parts of Georgia, including north Atlanta suburbs. DNR’s Wildlife Resources Division explains why, where the bears come from and what to do if you see one (hint: left alone, bears typically return to their established bear ranges). More than 1,500 people learned about Georgia’s wildlife at the annual JAKES Day at Charlie Elliott Wildlife Center May 7. DNR scientists and outreach staff also discussed animals, plants and habitats with the public at other events in recent weeks, including Endangered Species Day at Atlanta Botanical Garden May 14. Want to take your children fishing? Find tips on how and where, including DNR Kids Fishing Events near you, at www.georgiawildlife.com/fishing/kids-fishing. Nearly 4 feet long, this 13-year-old lake sturgeon was caught last month during DNR sampling on the Etowah River in northwest Georgia. 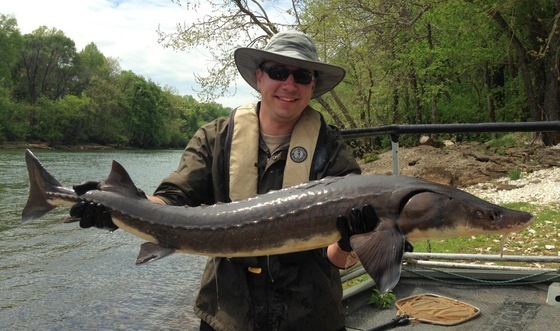 The agency’s Fisheries Management Section has been restoring this rare species in the Coosa River Basin since 2002, including the pictured sturgeon, which was only 2 feet long when first tagged by UGA researchers about 10 years ago. Critical habitat will not be designated for the northern long-eared bat, a species newly listed as threatened. The U.S. Fish and Wildlife Service says the habitat designation would not be prudent, citing factors including that the bat’s summer habitat varies and is not in short supply. Florida grasshopper sparrows made history May 9 when the first captive-bred chicks of this imperiled species hatched at the Rare Species Conservatory Foundation in Florida. With fewer than 150 of the sparrows left, the chicks are seen as a breakthrough for one of North America’s most endangered birds. Danny Smith tried retiring once. It didn’t work; find out why in this brief profile of Smith, a Nongame Conservation Section staffer and 50-year state employee. (Other) names in the news: Nongame Conservation Section Assistant Chief Mary Pfaffko teamed with Jonathan Mawdsley and Mark Humpert of the Association of Fish and Wildlife Agencies to write an article on state wildlife action plans for Wildlife Professional (paywall), journal of The Wildlife Society. The Georgia Conservancy will honor REI Outdoor Programs and Outreach Market Manager Daniel Jessee with the organization’s annual Longleaf Award at Verde! on June 25. – A mussel and snake interaction you’ve never seen. – Botanical Society explores Georgia bogs. – The man who managed River Creek for 50-plus years. "Bald eagles top 200 nests in Georgia for second straight year," Florida Times-Union. Also: WGCL-TV (CBS 46, Atlanta), Savannah Morning News, Albany Herald. "Sea turtle nesting underway along Southern Atlantic beaches," Associated Press. Also: Savannah Morning News and others. One more nest note: Loggerhead sea turtles started their nesting season in Georgia on time and, as the last two years, on Cumberland Island. Wildlife biologist Doug Hoffman of the National Park Service confirmed the state’s first loggerhead nest of 2016 at Cumberland May 3. The Georgia Conservancy’s Laura Buckmaster, who manages the organization’s Cumberland Trail Restoration Project, spotted the “crawl” that morning. 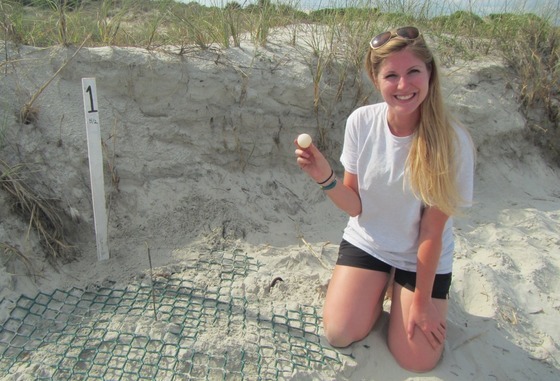 Buckmaster is pictured with the single egg taken from each nest (less than 1 percent of the average clutch size at Cumberland) for UGA genetic analysis documenting the number and relatedness of loggerheads nesting on the state’s coast. Georgia Sea Turtle Cooperative nesting updates.